The yard at Marina Pez Vela is really nice. 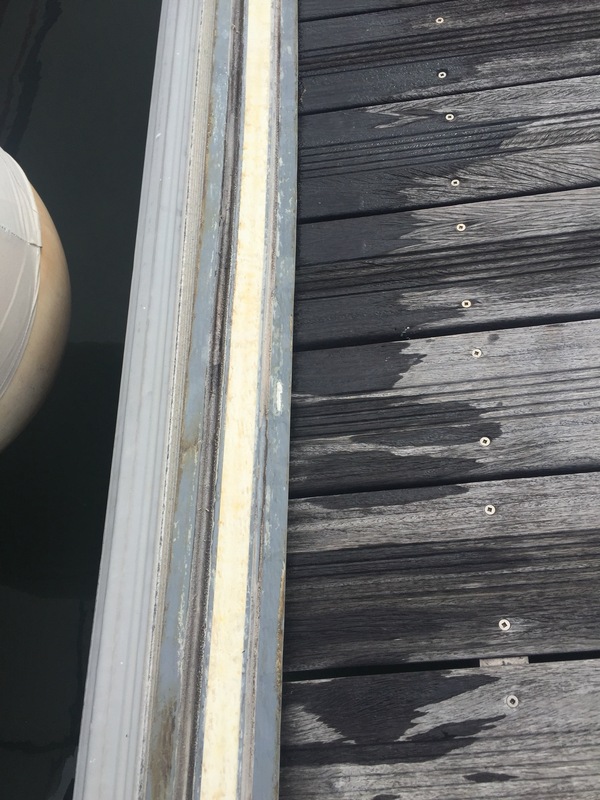 However, as with most things that sit outside for an extended period of time, the boat gets really, really dirty. 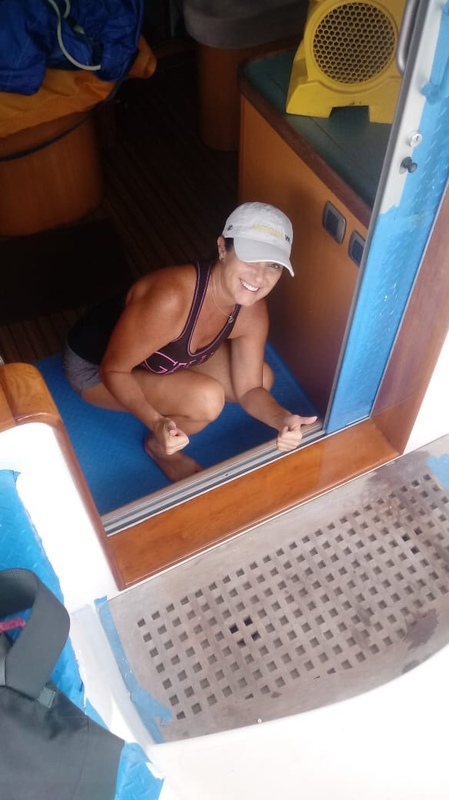 So, in between managing our insurance claim, we have been busy working on lots boat chores. Everything had to be removed from under our settees to enable the workers access to our house batteries, inverter/charger, COIs, and switches. So, all of those items were moved to our master head. 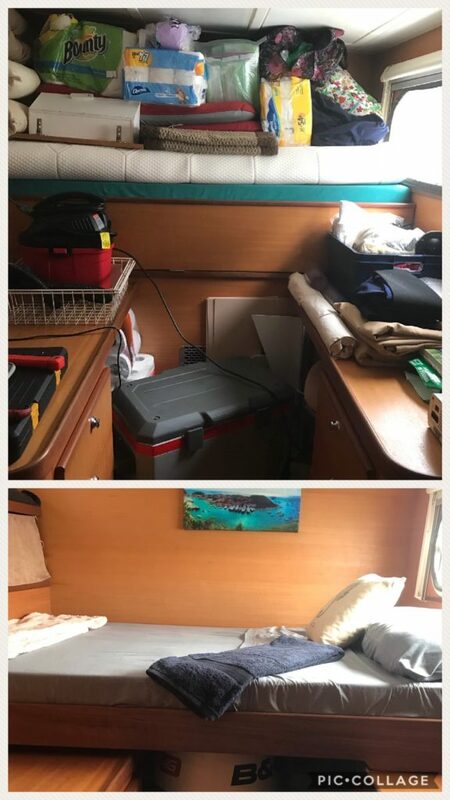 In addition, the beds had to be opened up to get to the carts and bilge pumps, and cabinets had to be emptied to get to the fridge and freezer pumps. All of that “stuff” plus our settee cushions that are normally stowed are now stuffed in other places. It’s heartbreaking to see your home in such disarray. So, we do what we can to keep it clean and organized as much as possible. 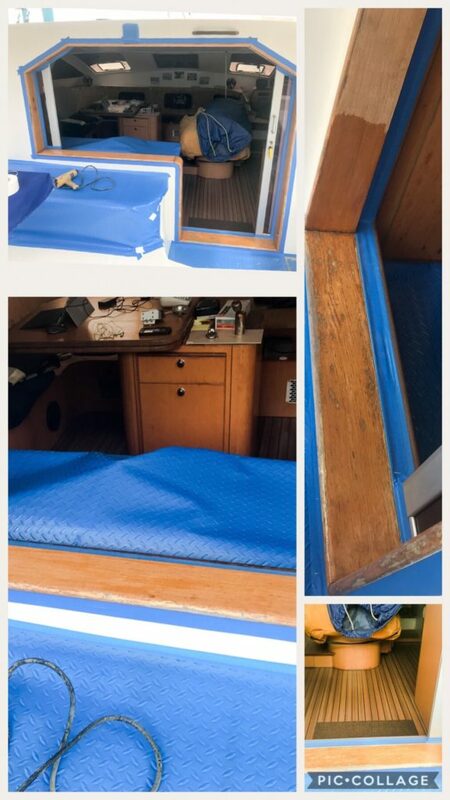 The salon photo below was taken “before” we put some nice artwork up behind the settees, but you get the general idea of how clean we keep our boat on a daily basis. 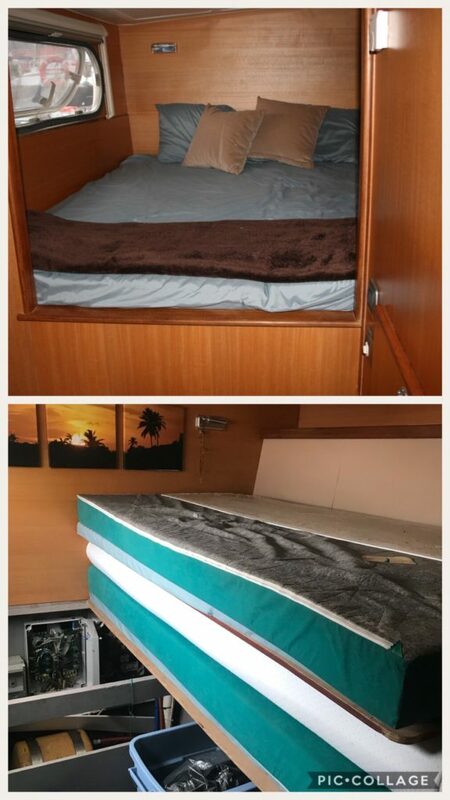 The bottom photo has all cushions removed, and our two sails (main and jib) in the salon. The master cabin before photo was again taken before we put up our beautiful artwork. 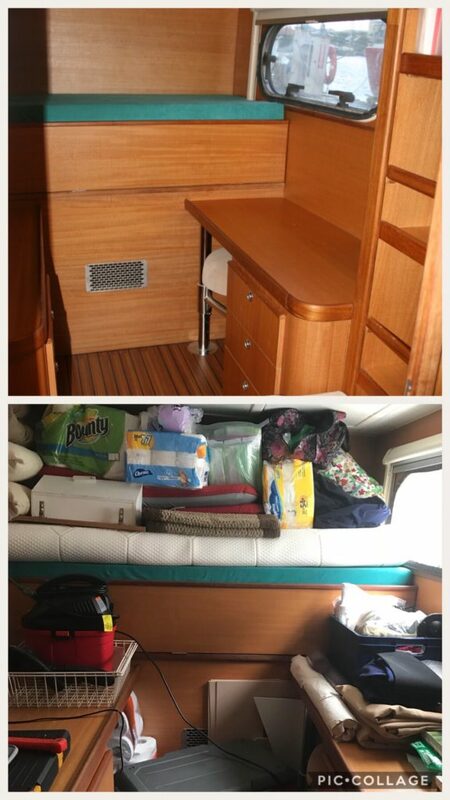 The after shot has the bed folded up for easy access to equipment underneath. 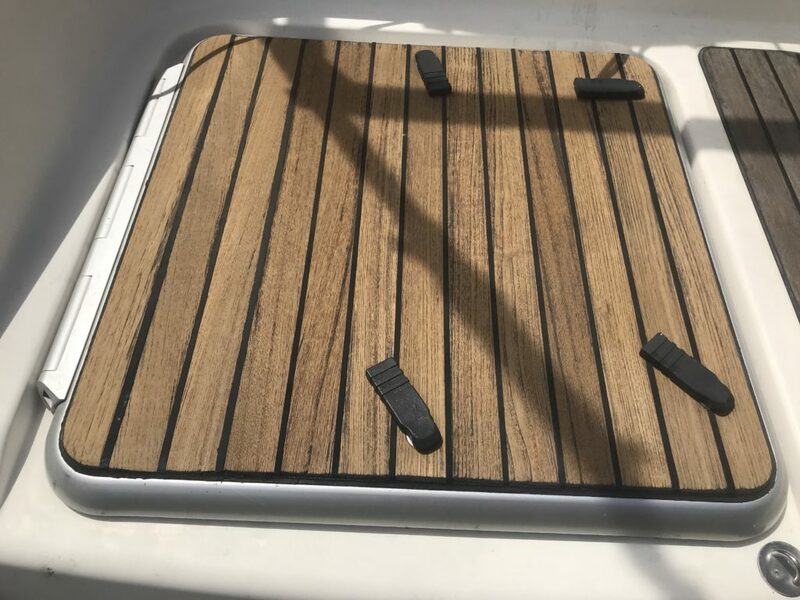 I love our starboard master head because it is roomy, white, and breezy. 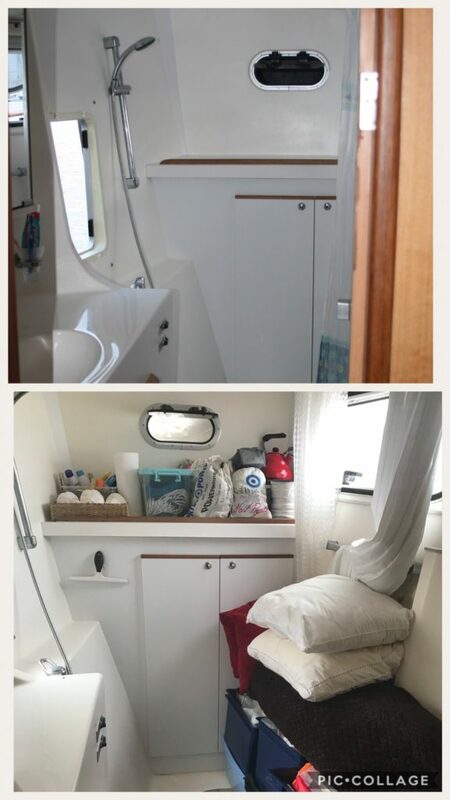 Sometimes it is the coolest place inside the boat. We keep it spotless because that is just how we are, but now it is stacked with stuff. 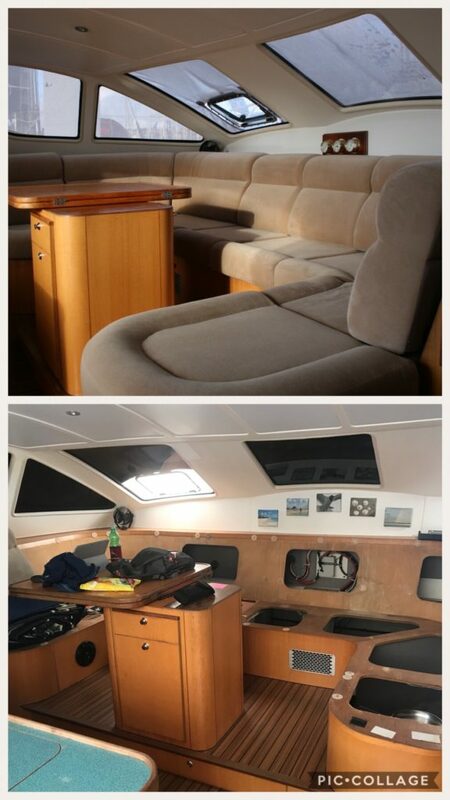 The port aft cabin is a office / cabin. Typically we use this room as our “work room” so we may have some tools and our sewing projects out if we don’t have guests. Now it is a bit of a disaster with stuff coming out of all areas. 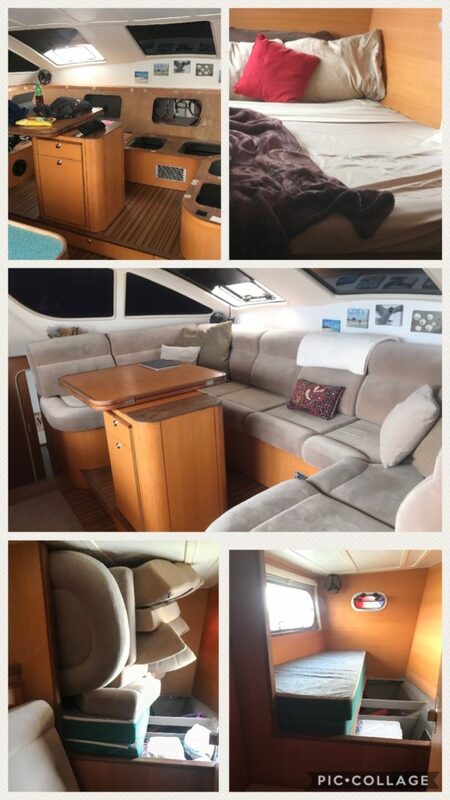 A few of the boat projects we have completed while on the hard….waiting. 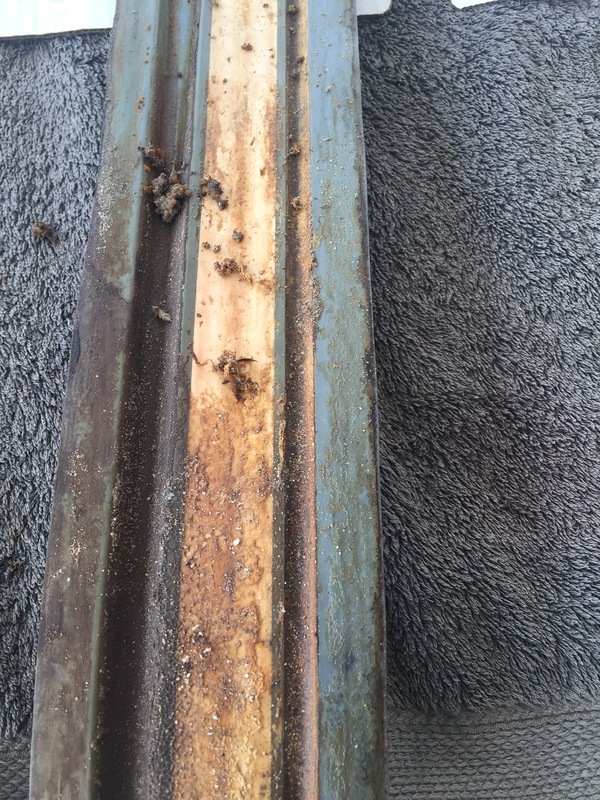 Most of these chores or projects have been done two or three times due to the mold and constant mess from various workers. All this work, on top of managing the insurance claim, three vendors, large budget, shipment of parts, visa renewals, extended cruising permit, Galapagos permit, and long stay visa for French Polynesia – good thing I’m a project manager. Mold grows within weeks of being clean as it rains every day here creating a great breeding environment. So, you have to stay on top of it. 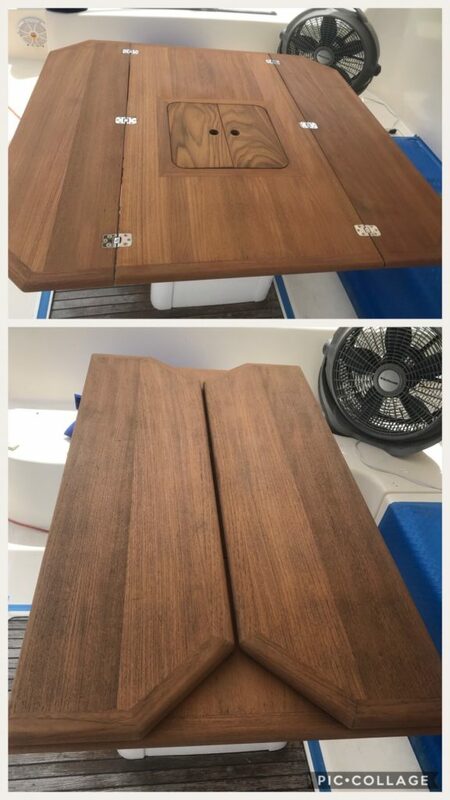 Scrubbed teak hatches, sugar scoops, and swim ladder steps. 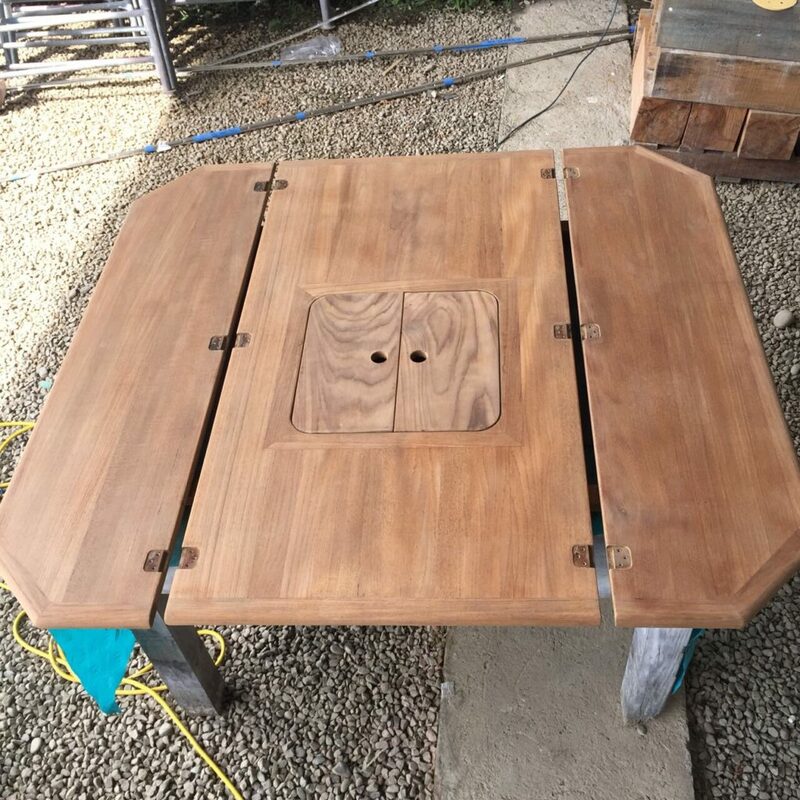 Then apply Star brite Teak Oil. 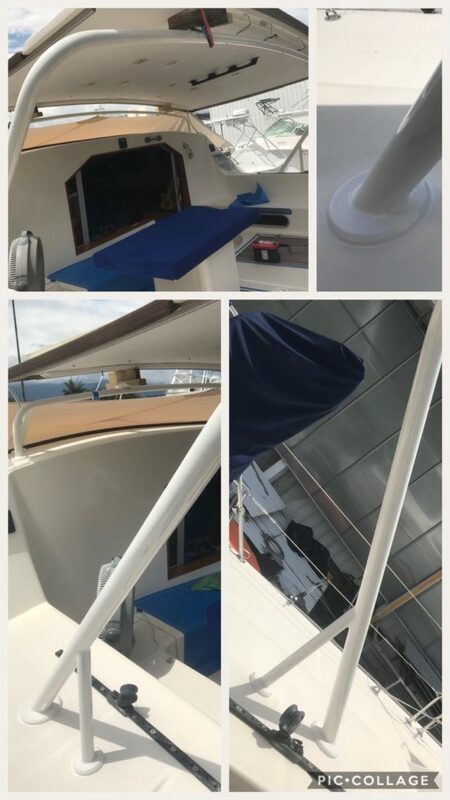 Removed and replaced silicone around front & back bimini rails and around bimini port, back, starboard wood accents. 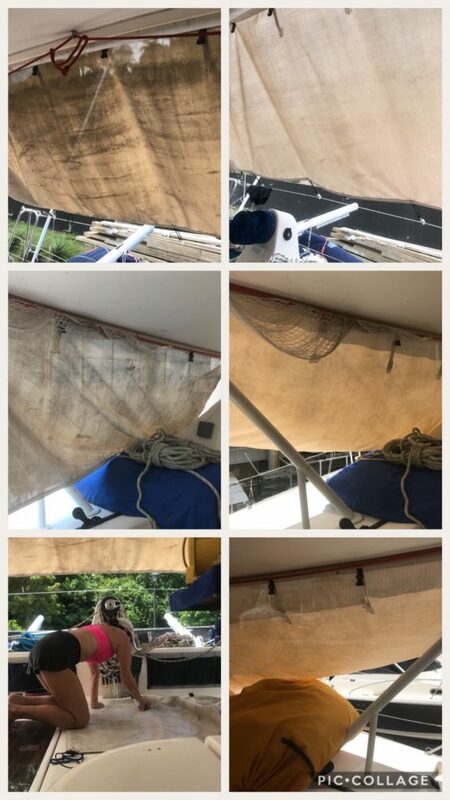 Scrub both sides of all three sunshades that were covered in dirt and muck after a few months on the hard in the yard. Had to do this twice due to the excessive dirt. Scrubbed, sanded, and applied Star Brite Teak Oil on all exterior wood accents. 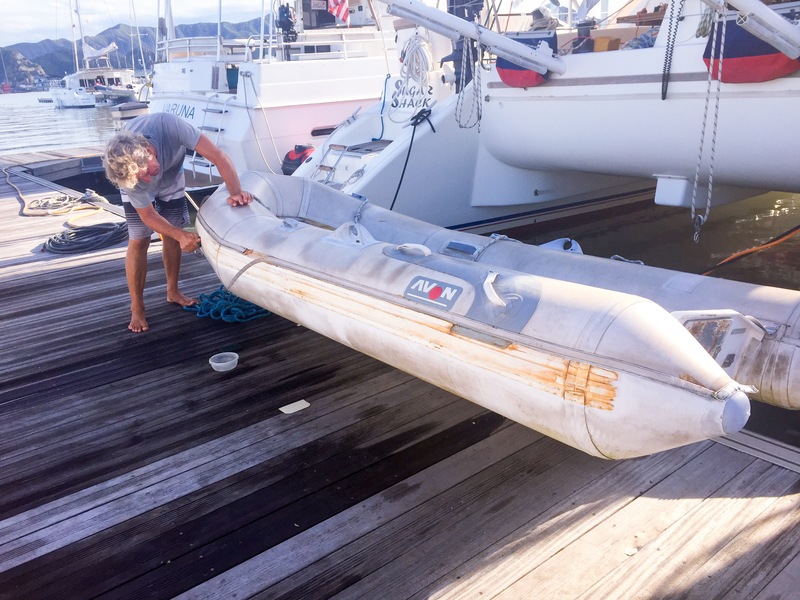 The bottom of the dinghy is always a challenge to clean. Most cruisers will take her to a beach, flip her over and clean with sand and soapy water. However, our outboard is so big and heavy that we cannot taker it off/on easily, so we cannot flip “Sweetie” over. 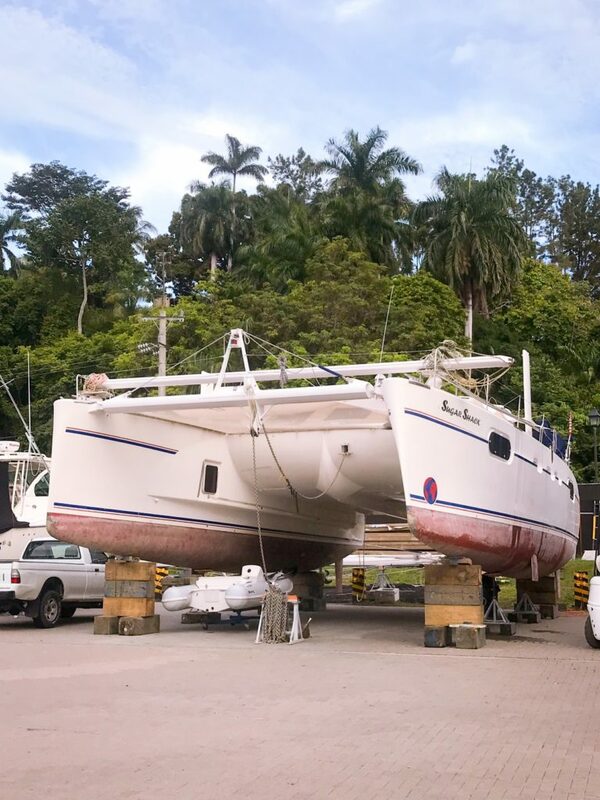 With the boat on the hard and the outboard on the stanchion, we could easily flip her over so I could clean her bottom. 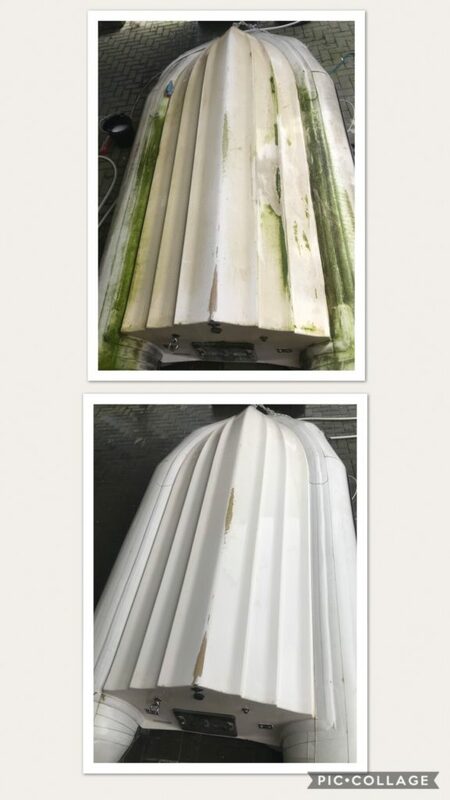 This was not nearly as bad as many other dinghies we’ve seen, but this was bad for “Sweetie.” Using a lot of elbow grease, soapy water, scrub brush and “On Off” on the fiberglass hull she came clean after 6 hours of hard labor. 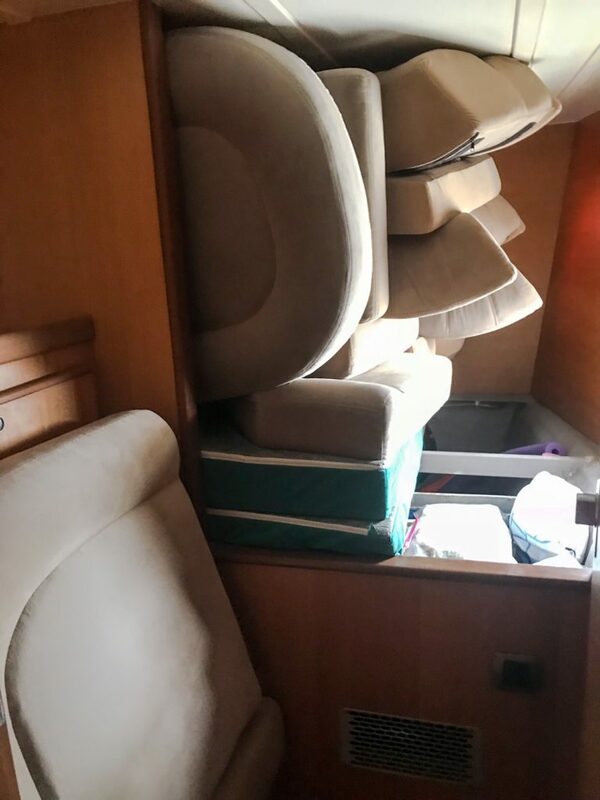 We left our helm seat cushions out for a comfortable place to sit and within a few weeks we had mold. It rains here every day, for hours. So, they had to be scrubbed clean before being stowed inside. No more cushions outside. Helm cushions moldy from rain. Matt has been extremely busy as well. Cleaned out all storage areas. Check out these clean props, freshly lubed and sporting new small and large zincs! We removed our SSB plates to clean them. Sewing projects: repaired wench covers, dinghy fuel tank cover, sail bag, hat. On the plus side, we did manage to create new boat cards and stickers. We often trade boat cards with other cruisers so we can stay in touch as we travel. These are much cleaner, with more information, and has a fabulous photo of us. 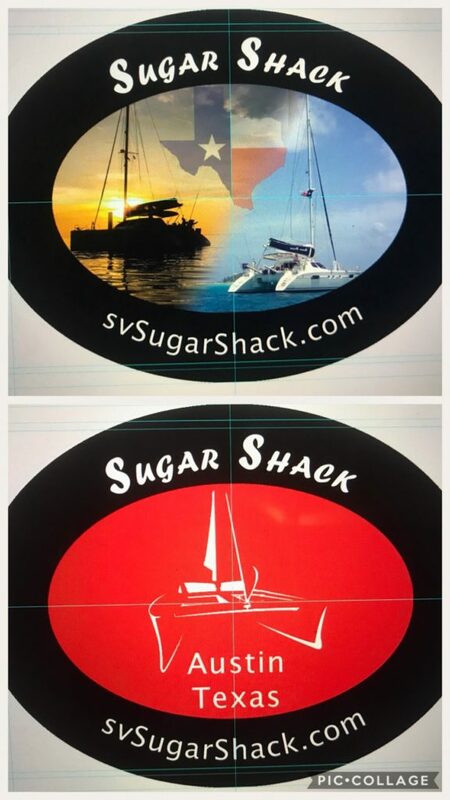 Matt created two designs for our boat stickers. We ended up going with the top graphic with images. Lots of places let you put your sticker up at their establishment which is fun to represent Texas. 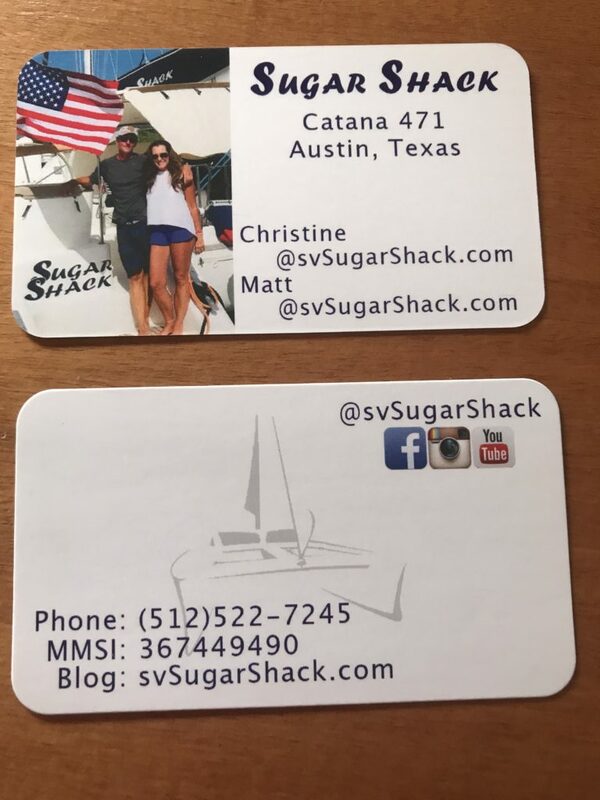 Sugar Shack on the Hard in Marina Pez Vela. Her boom lies across her bow, her mast is on the ground behind her and all her sails, rigging, sail bag, spreaders, etc…are down. 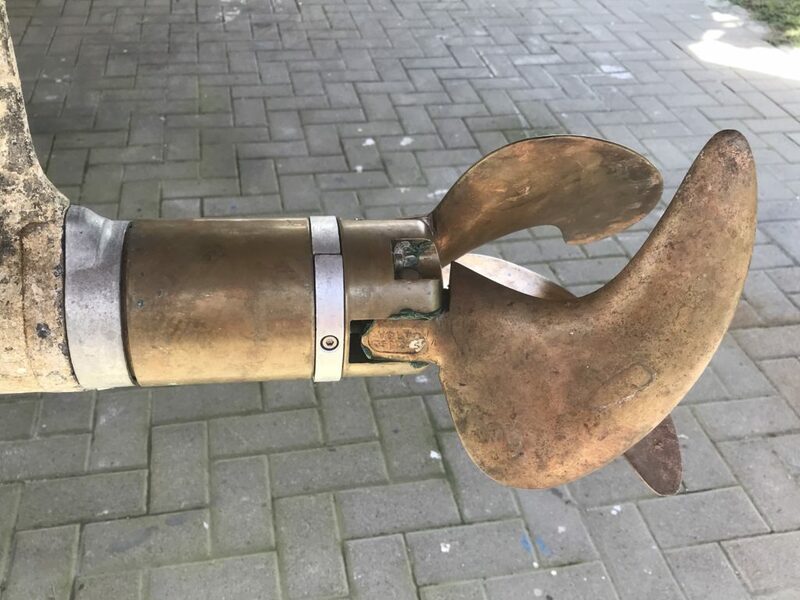 She desperately needs a new bottom job (even though her current one is less than 18 months young)…the elements will do that to your ablative paint. 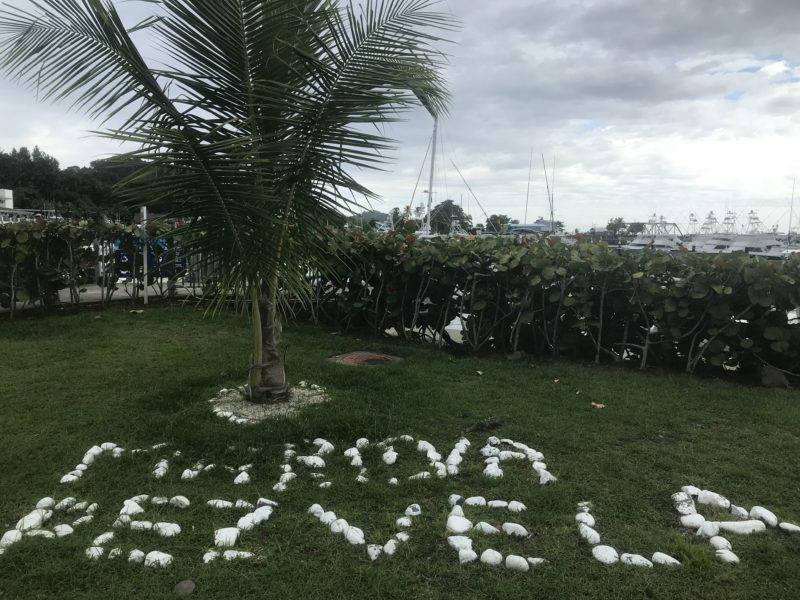 This entry was posted in Costa Rica, Repairs and tagged boat cards, boat chores, boat projects, boat stickers, bottom job, business cards, cleaning, dinghy, Marina Pez Vela on October 16, 2018 by Christine. 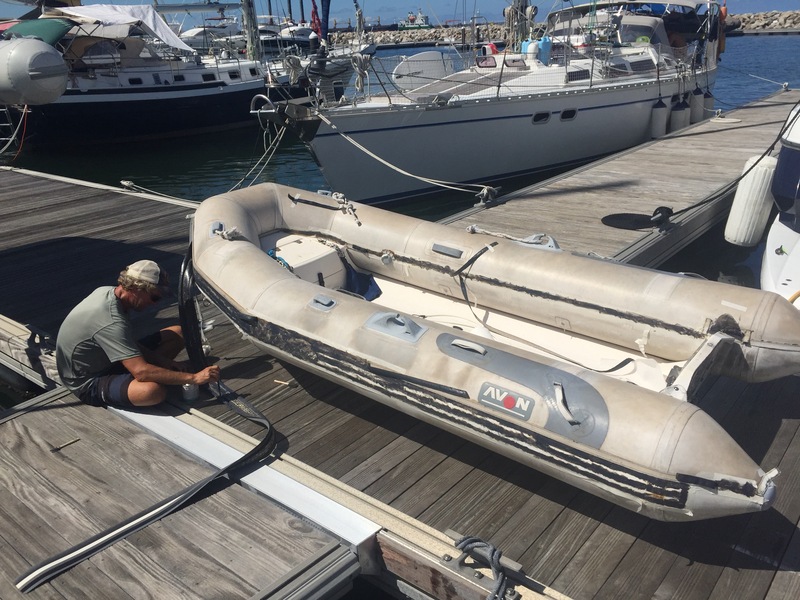 As a cruiser, you rely heavily on your dinghy as it is your “water car”. The only time you don’t need your dinghy is when you are in a marina. 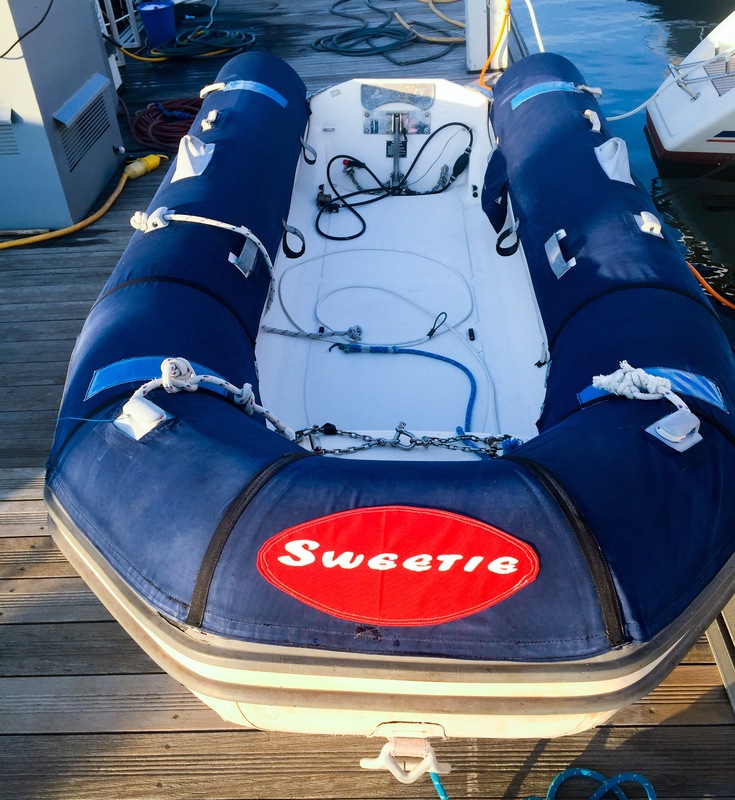 Our dinghy, “Sweet N Low” or “Sweetie” as she is now referred to, has been in dire need of some lovin. We have needed to work on her for a while, but didn’t have several days in a row where she wasn’t in use. 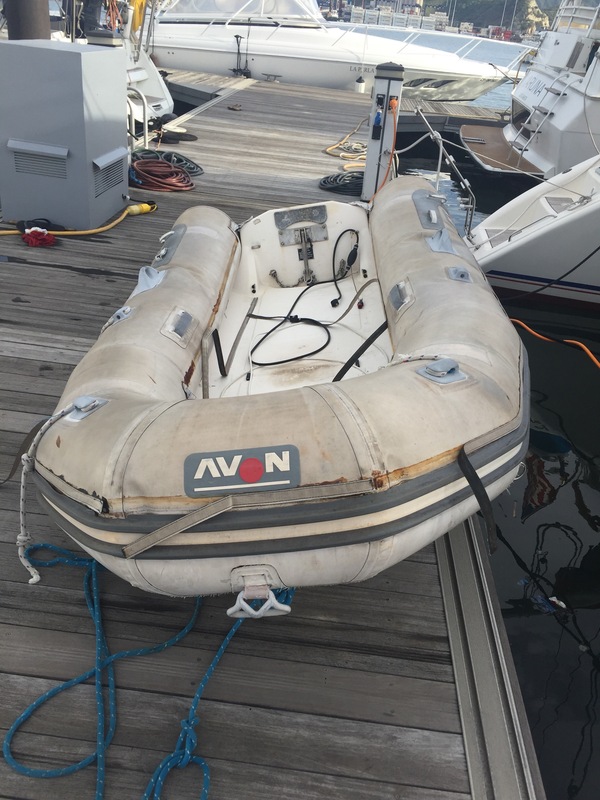 Dinghy tubes are typically made from two types of materials: PVC or hypalon. 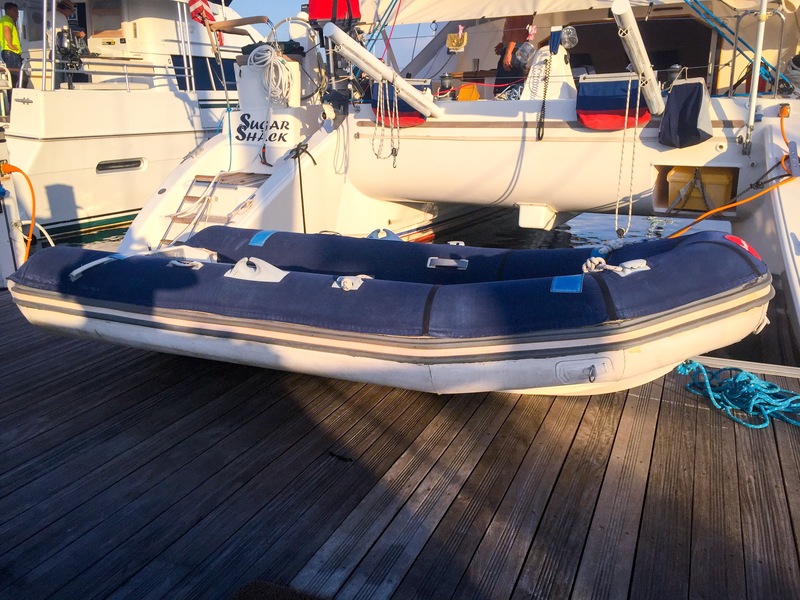 We have a hypalon dinghy which requires a specific type glue. Matt found a glue used for escalators, Cement SC 2000 which is a two-step gluing agent that requires several days to cure. Several chemicals can be used to remove this type of glue. MEK, acetone, and mineral spirits. They are wicked on your skin and have a pungent odor. 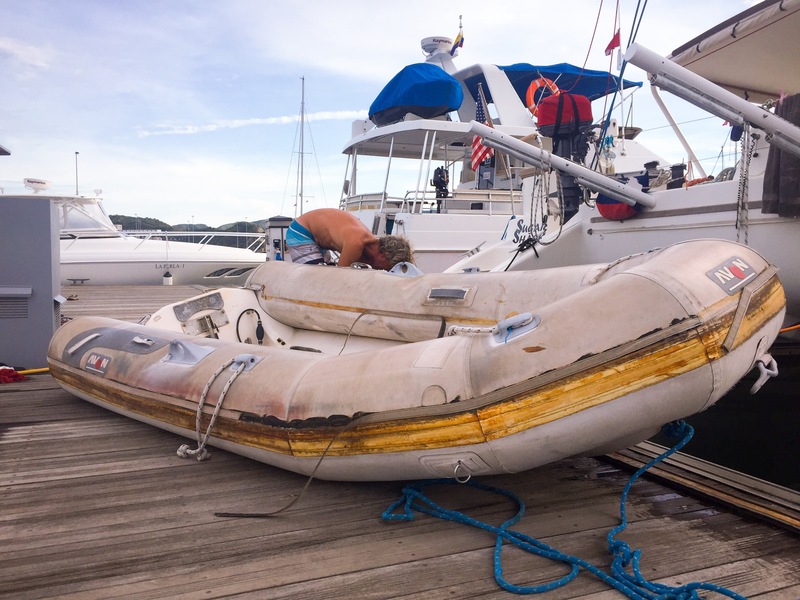 Several videos show you how to remove the glue as well, but they require tools that we don’t have on the boat. We had a few ounces of MEK to test in small areas. We had less than a liter of acetone and about 3.5 liters of mineral spirits. All three seemed to do the same thing, none better than the other. Since we had more mineral spirits than the other two that became the solvent of choice. My first thought was to find out where we could get more MEK or acetone so I went to Facebook. I know, you are thinking she’s lost her marbles. Maybe–probably, There is a really good Facebook page for Columbia cruisers and I thought I’d ask them where to get our supplies. I explained our project and what I was looking for and within an hour I had a reply. Just not the reply I expected. I was told to “never, ever ask a local Colombian for acetone as it is a key ingredient used to make cocaine. And if I were to ask around, they would think I was part of the Pablo Escobar family.” What the HELL! Yikes! Won’t go down that road. So, we will make due with what we have on board. Typically, we would avoid showing pornographic images on our blog, but for the sake of education, we will show you Sweetie without her chaps on. She looks so very sad. 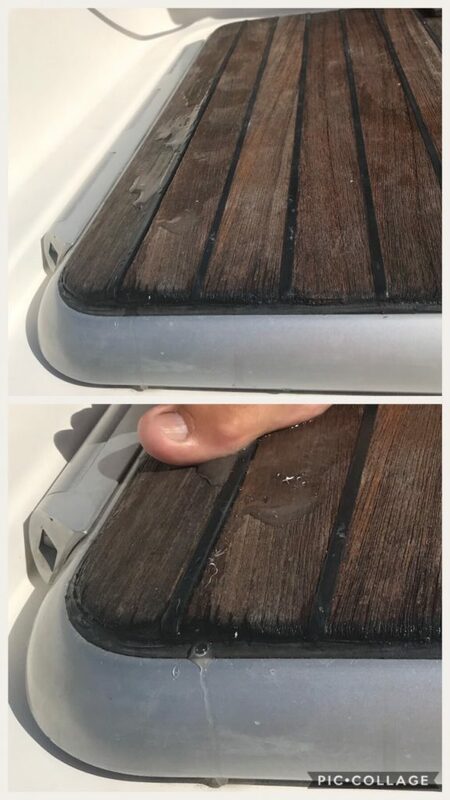 Note the velcro coming off both inside and outside the dinghy, the rub rail (gray & white below the velcro) is coming off and she is all around a mess. 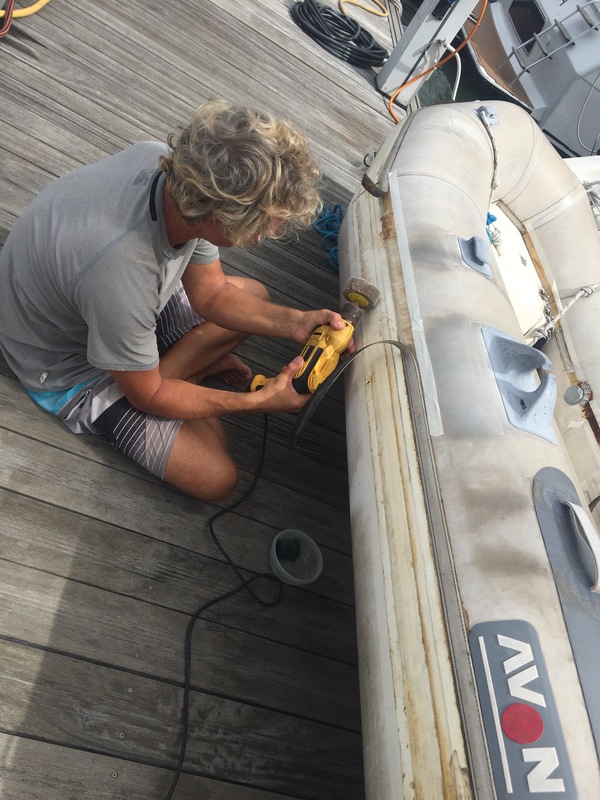 Matt removed the rub rail with little effort and looked mournfully at the mound of glue that had to be removed from the entire circumference of the of the dinghy and the rub rail. All that brownish yellow stuff is old glue. Sweetie with rub rail off and side velcro in pieces. The port side of the dinghy had been repaired in the past using Matt’s escalator glue (it dries black) so it was a bigger mess. Matt tackled the dinghy first while I worked on the rub rail. We both started with the worst part of the project-the port side. The troughs had a combination of glue, dirt, sand, and muck. 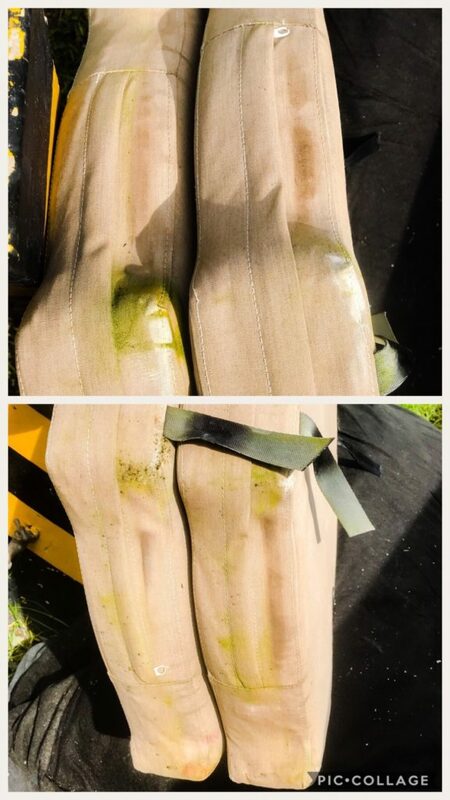 They didn’t need to be totally glue free, but the chunks had to be removed. 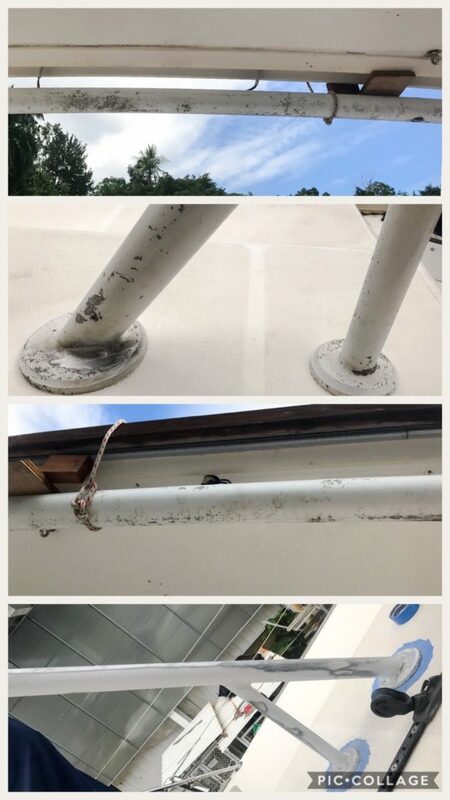 The two gray outer rails and the white center had to be 100% cleaned with no sticky residue as that is where the new glue would be applied. 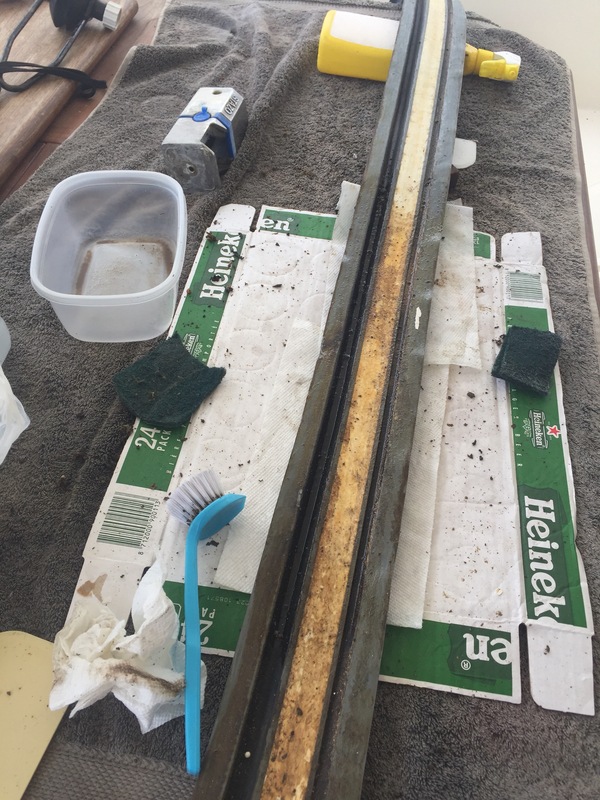 Rub rail being cleaned. Top cleaned, guck in crevices and bottom full of glue. It was frustrating because it took a lot of work that garnered very little progress. It takes a lot of patience and elbow grease. You can see that what was once yellow is now almost white again. Matt finishing up removing large pieces of glue by hand. After removing the large chunks of balls of glue, Matt used a flap wheel. This removed the last residue of stickiness. Matt removing last sticky residue with flapper. 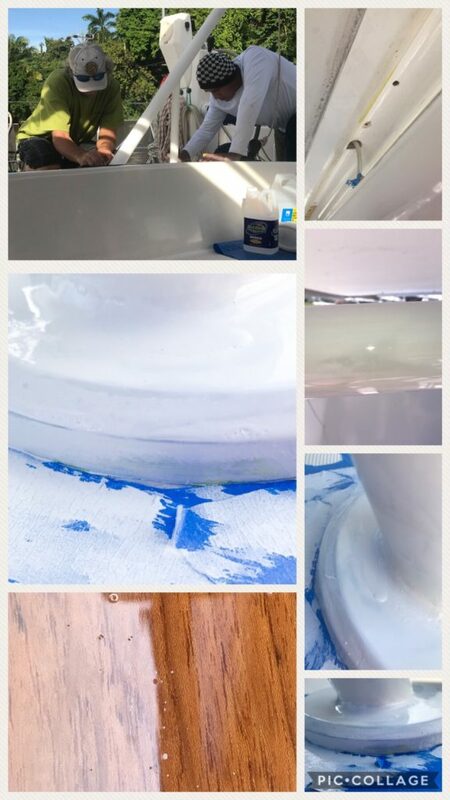 The process for the rub rail was a little different I used a small brush and mineral spirits in a circular motion to loosen up the glue and remove the large chunks. Then I used the scraper to remove the chunks in the troughs on either side. Then I used a bristle pad to get the rest of the glue off. 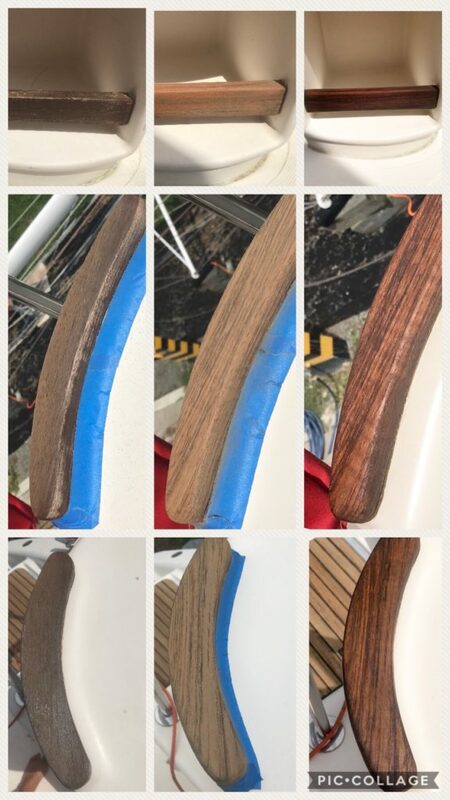 Cleaning the rub rail. 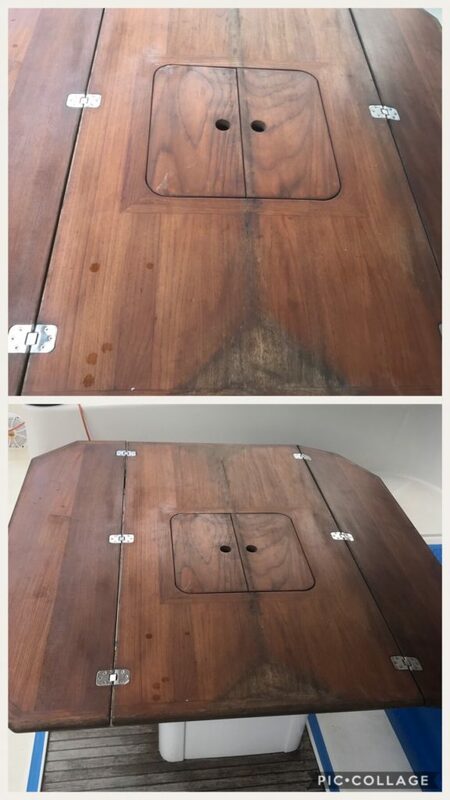 Top cleaned, bottom not. After the chunks were gone, I used the flap wheel to remove the last of the residue. Rub rail before sanding begins. It is amazing how nice it looks once all of the old glue is off. The flapper wheel really cleaned it up and removed the last bits of stickiness. Matt and I talked through the gluing process several times before he mixed the compound. We had a lot of area to cover and a limited amount of time to do it in. 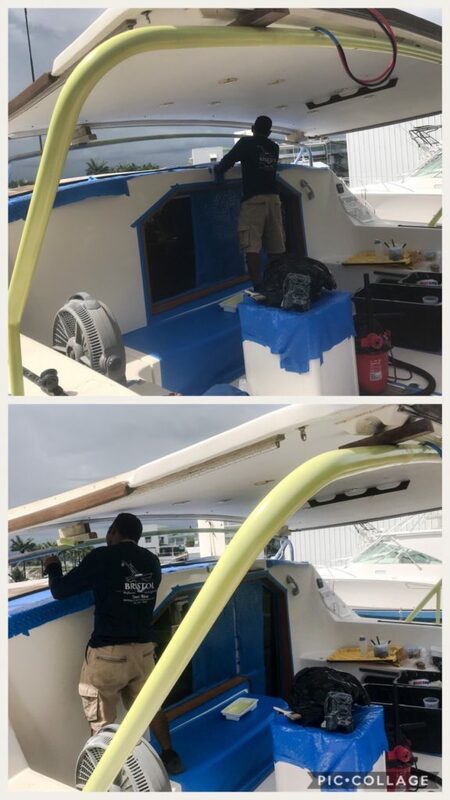 First, you mix the two elements together, then you spread a light coat over the dinghy and the rub rail, and then wait an hour. It took us 50 minutes to cover all areas with the first coat. So we had 10 minutes to get a drink, rest, and pat ourselves on the back while the compound sat in a bowl of ice water to prevent it from curing. 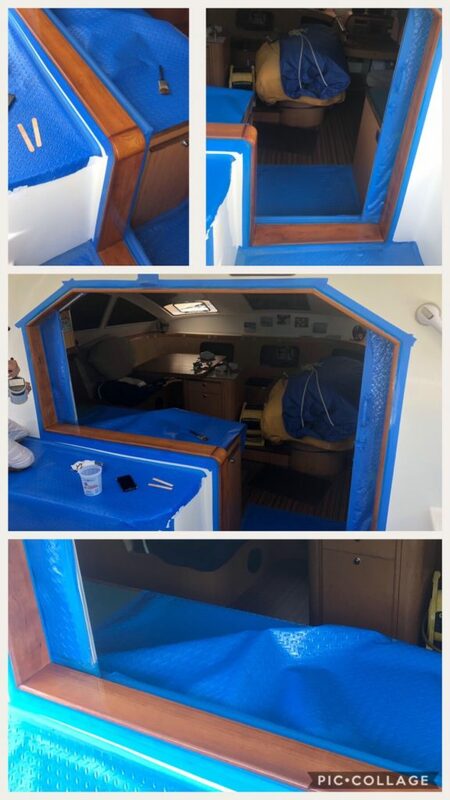 The second step required us to reapply another light coat over a 3′ section (both the dinghy and rub rail or both the dinghy and velcro), wait 15 minutes until it’s tacky and then stick the pieces together. Remember how nice it looked all clean and white – now it is all black and gooey. We were both working with 1/2 kg can that had to cover the exterior rub rail, exterior velcro and interior velcro. And it had to be applied to all pieces. Did I mention that the temperature speeds up the process and hardens or cures the compound? And did I tell you it is HOT!? 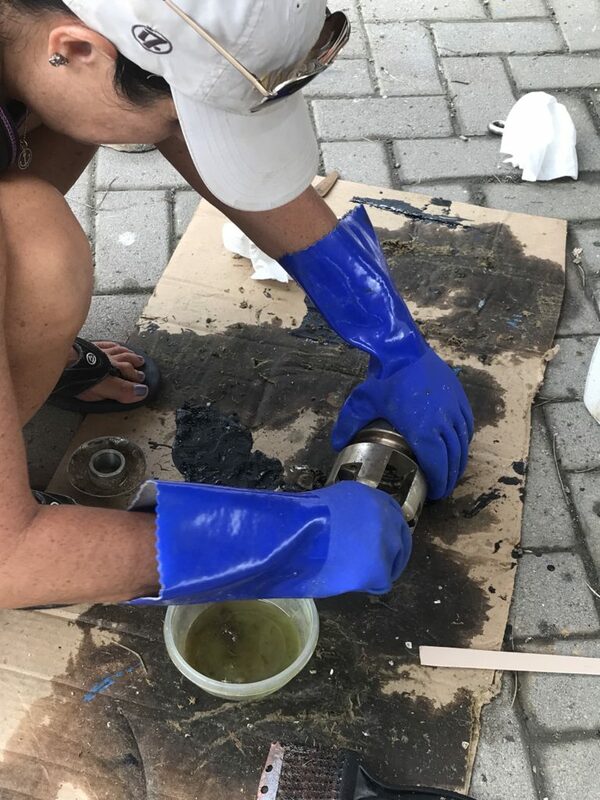 Somehow we managed to squeak every drop out of the can to cover everything we needed. We destroyed several brushes, but it was done. The only unfortunate thing is that we came up short on one side. We should have started in the middle and worked our way down each side. 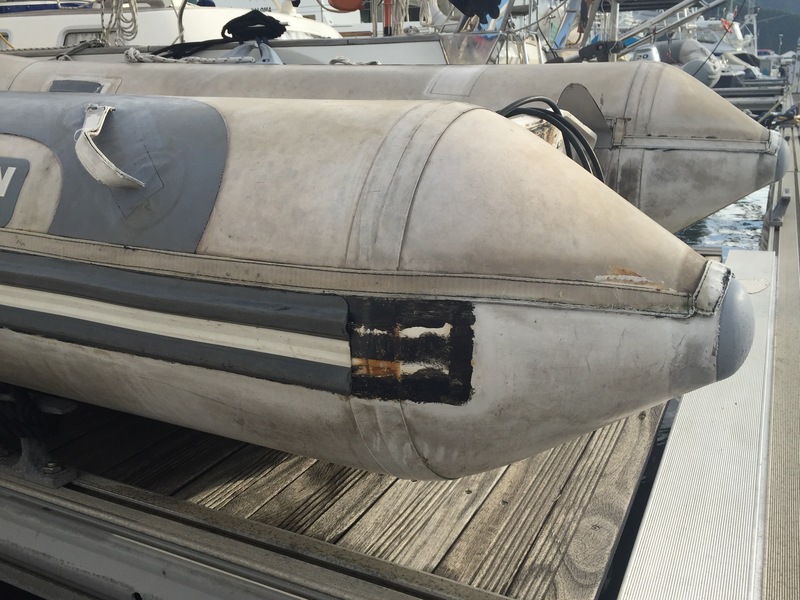 Either the dinghy was super inflated due to the heat or we were supposed to stretch the rub rail more to make it fit. Too late now, we cannot start over–it is stuck on good! 3″ section that came up short. We let her dry overnight which gave it strength of 32 lbs per square inch. Pretty darn strong. 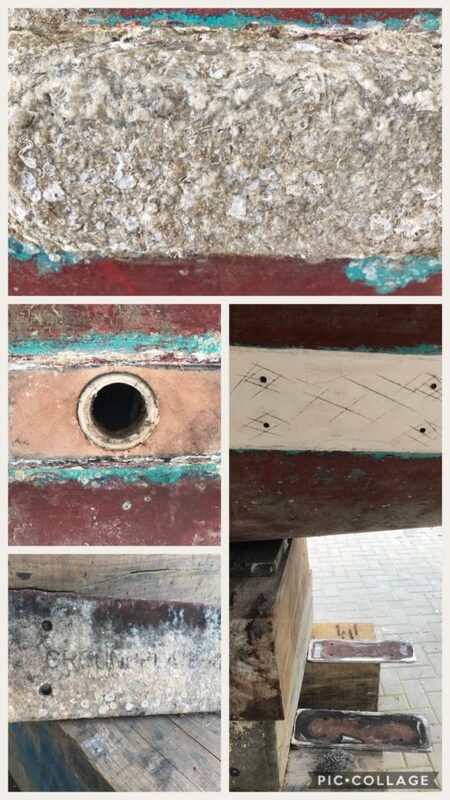 This entry was posted in Columbia, Repairs and tagged acetone, catana, columbia, dinghies, dinghy, dinghy repair, flapper wheel, marina life, MEK, mineral spirits, rub rail, sailing, santa marta, santa marta marina on January 2, 2018 by Christine.